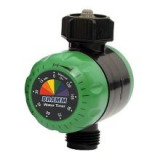 Simply set desired watering time and this handy mechanical timer shuts off water for you! Allows you to turn on your hose or sprinkler, leave the house and get on with your day without having to remember to turn the hose off. Attach water timer to faucet, and connect and tighten garden hose to water timer. Turn dial to set desired watering time up to two hours. We want you to be completely satisfied with every purchase you make. If you are in any way dissatisfied with a product you ordered, we'll exchange it, replace it or refund your money within 30 days of purchase. Simply email us the problem, and we'll take care of you. Certain products have extended warranties (up to 50 years!) that are listed on the particular product page. Please call us at 1-888-451-6752 if you need further clarification.